Fall may just be the ideal time to get a new deck installed. It is no secret that adding a deck to your home is a fantastic decision. For starters, it adds tremendous value to your home, so any money you spend, you will eventually see a return on your investment. Additionally, a deck can be enjoyed at any time of the year. You can gather around an outdoor fire in the winter to stay warm while enjoying the outdoors. Or in the summer, you can use your deck as a place to host a cookout and grill up some delicious food for your family and friends. Although just because your deck can be enjoyed year round, does not mean you should necessarily install it at any point in the year. 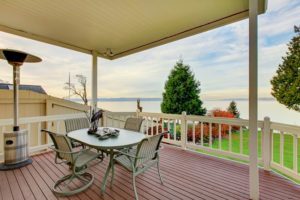 If you are planning on installing a deck, then it may be for the best you consider installing it during the fall, and here is why. Deck installation peaks during the spring and summer seasons because this is typically when people most want to have a deck to enjoy. That means trying to get your deck installed at those times of the year will result in difficulties trying to get an appointment, as well as possible project delays because they are attempting to meet the needs of numerous clients. The fall is seen as the off-season for companies that install decks, so you will have your pick off any company you want to install your deck for you at the time that is most convenient to you as well. Odds are, you will also be able to find a reasonable price even amongst the best deck contractors due to the lack of business this time of year as well. As said before, the summer is a popular time for deck installation. This means that those working on your deck installation will be forced to work in the harsh summer weather, when instead they could work in the cooler, more relaxing mild weather found in the fall. Since the weather will make working conditions easier for them, your deck is likely to be finished more quickly and efficiently than in the summer. It is also advised that you do not try to install your deck in the winter because like the summer, the weather is harsh. If you want your deck to be ready in time for the spring, then doing it in the fall is the best move. Lastly, you will want to get your deck constructed in the fall because it will give you even more time to enjoy the outdoors. Although you can use your deck in the winter, you will certainly not be using it as much then. So why not get the most out of your future deck by installing it in the fall, and enjoying it as much as possible while you can. This entry was posted on Friday, September 28th, 2018 at 2:28 pm. Both comments and pings are currently closed.